"Seven Hells! 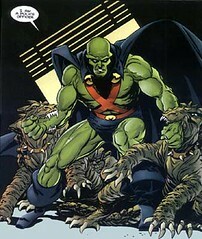 ": Wanted: The Martian Manhunter! What do Superman, Batman, Wonder Woman, Aquaman, The Flash, Green Lantern, The Atom, Hawkman, Black Canary, Enemy Ace, Sgt. Rock, The Doom Patrol and even The Blackhawks have that The Martian Manhunter DOESN'T. I think this is just wrong. One of the original, founding members of The Justice League of America is THE most under-represented of DC's hero set and I believe an Archive Edition will help fix this. As much as I'd love to think of myself as a DC Comics "expert" it dawned on me today that my experience with this great character BEGINS with The Justice League's worst team. The 80's incarnation of Vibe, Vixen, Steel, Gypsy, Elongated Man, Zatanna and Aquaman. No one should have to learn about The Manhunter from that crap. On any given day, we can walk into a comic book store and pick up an Archive Edition of The frickin' Seven Soldiers Of Victory, for God's sake! Yet, we can't learn as to WHY we should even give a damn about one of comics' most interesting and enduring characters. WHY is he the rock that holds The League together? WHAT led him to be this rock? WHEN did this happen? WHO wants to know? WE want to know. Let DC Comics know that we want to know. Comics, curiousity and the character we all know as The Martian Manhunter will all be the better for it. My first experience with J'onn was in JLA #200. The story opens with a retelling of their origin and I kept wondering, who the heck is the green guy? Then the story moves into modern day where Firestorm is on monitor duty and the green guy breaks in. What the? Not only is the green guy weird, but he's evil? Good times. I always liked the run from.. um.. I want to say "Strange Adventures"? (the one with Robby Reed- Dial H for Hero). MM was undercover, infiltrating a "SPECTRE"-type criminal organization. (or maybe it WAS Spectre?) Anyways, it was fun stuff. One of the best things about him is that's he so versatile as a character you can imagine him as a back-up feature in ANY DC BOOK (except the Vertigo Imprint). Maybe that's how they should use him...? What if every week at least one of the regular DC books coming out had a back-up story in it? There could be a cadre of Backup Regulars like Martian Manhunter, the Atom, Dr. Midnight, Firestorm (since he'll soon be homeless), Animal Man, et al. I for one would enjoy that. is Firestorm getting s**tcanned for sure? I haven't heard any announcement... If so, that's unfortunate, I thought it was a pretty fun reinterpretation of the character (and I say that as someone who was a BIG Firestorm fan when Ostrander was writing the book). ...boy, the way DC's been cutting books, the Manhunter creators must be thanking their lucky stars for their book's link to Identity Crisis et al. I'm no expert but all you have to do is look at the numbers. They're not that great and it's kind of a general rule of thumb that if there's zero talk of a trade, a book's future ain't looking so hot. Don't get me wrong, I love this book but with no real connections to "Infinite Crisis," that we know of, Firestorm doesn't seem to work into DC's future plans. With the Giffen/ DeMatteis JLI books, J'Onn became my favorite DC character. In addition to having tons of super-powers and being the rock that held the group together, he was so _human_. While I laughed at Beetle & Booster, Guy et al, I cared about J'Onn. That Despero story killed me as a young teen. I'm glad Morrison used J'Onn effectively in JLA, and made him a heavy hitter getting respect, even from Bathole. I also dug the underrated Ostrander/ Mandrake series. I hope MM gets an archive soon.